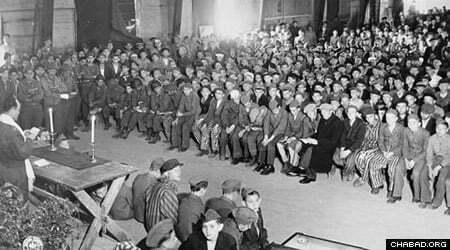 Rabbi Herschel Schacter (left) conducts the service of the first day of Shavuot for survivors of the Buchenwald concentration camp shortly after their liberation. Rabbi Herschel (Tzvi) Schacter, an influential community activist and congregational rabbi who served as chairman of the Conference of Presidents of Major American Jewish Organizations, passed away March 22 in the Bronx, N.Y. He was 95. Schacter graduated Yeshiva College in 1938 and Yeshivat Rabbeinu Yitzchak Elchanan (RIETS) in 1941. He was a student of Rabbi Moshe Soloveitchik and also of his son, Rabbi Yosef Ber Soloveitchik. As a young rabbi serving as a chaplain in the U.S. Army during World War II, he participated in the liberation of the Buchenwald concentration camp in 1945, and later aided in the resettlement of displaced persons. Schacter went on to serve as a congregational rabbi of the Mosholu Jewish Center in the Bronx for more than five decades, and in leadership positions at many American Jewish organizations. He was founding chairman of the American Jewish Conference on Soviet Jewry, and chairman of the Chaplaincy Commission of the Jewish Welfare Board. In addition, he was Director of Rabbinic Services at Yeshiva University, and for many years served on the board of the Union of Orthodox Rabbis, and was chair of the OU’s Communal Relations Committee from 1970 to 1982. Schacter grew up in the Brownsville section of Brooklyn, N.Y. He attended Yeshiva Chaim Berlin elementary school, and transferred to Mesivta Torah Vodaas in Williamsburg for high school. Later, he moved to Yeshivat Rabbeinu Yitzchak Elchanan, where he said he could receive a more well-rounded education. It was during this period, the early to mid-1930s, that he first encountered Rabbi Yisroel Jacobson, the representative in prewar America of Rabbi Yosef Yitzchak Schneersohn, of righteous memory, the sixth rebbe of Chabad-Lubavitch. Schacter’s nomination in 1939 as the representative of RIETS to Chabad’s “Achei Hatmimim” student committee reveals the depth of his involvement in the early establishment of the movement upon American shores. Schacter remembered this as a “critical period.” A few months later, six of his “colleagues, contemporaries, the young men who brought me into the Lubavitch circle,” made the long trip to Otwock (Otvotzk), Poland, to meet the Rebbe, Rabbi Yosef Yitzchak Schneersohn, and to study in the Tomchei Temimim Yeshiva. He is survived by his wife, Pnina G. Schacter; his children, Rabbi Jacob J. and Yocheved Schacter, Miriam Schacter and Dr. Benjamin R. Gampel; four grandchildren; and eight great-grandchildren.